The Kingmaker Adventure Path ventures into the eastern portion of the Stolen Lands, where strange disappearances summon stout-hearted heroes to investigate. 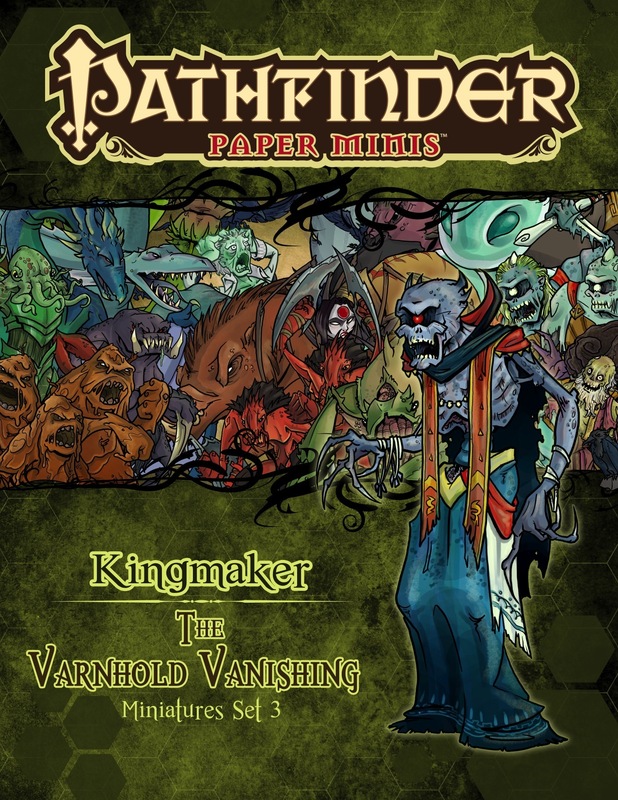 Long-dead abominations, prehistoric fauna and more await in this Pathfinder Paper Minis set, which contains everything you need to run "The Varnhold Vanishing," part three of the Kingmaker Adventure Path! The minis are neat and a bit comics. I wish I had it sooner xD. and I greatly wish the next one will be released this year. Great bunch of Mini's and tailor made for the AP. Everything you need is here. Every mini is good if not great. Crystal's style has a cartoon feel to it that my group likes. Some of the mini's in this stood out for one reason or another and I will put that in the spoiler. Daemon, piscodaemon second hardest fight for my group and this mini looks mean! Dread zombie Cyclops- Fear them! With this set of 4 you will. Flytrap - Second favorite from the set. "Feed Me!" Greater water elemental- Favourite mini from the set. Nomen Centaur - Good and bad points for this set of 8. Bad is that the faces and poses seem very cut and paste. On the good side the color differences are enough that you will not confuse them on the map. Roc- While I am not a fan of the vulture like appearance it is on big nasty bird. Purchased and absolutely beautiful! Thank you. Been waiting so long for this that our group finished book 6 two weeks ago (after 18 months of play). Still bought it, review in a bit. So sorry that these sets take so long. It's difficult to juggle a fulltime day job and fulltime freelancing schedule. I'm gonna need more glue! Glad to see them and happy to buy them. This is one AP that I plan on running again in the future. Plus you have spent some quality time making great modules as well. If you ever "in your spare time" make mini's for The Harrowing I will buy two sets! Worth the wait! My players love the style of the artwork. Really hope they continue with finishing all the adventure paths with paper minis. GET ON IT! @Crystal Frasier, any idea if/when you will finish the minis for the Kingmaker campaign? Love your work and would love to use them for my game! The Kingmaker campaign I'm running starts Varnhold Vanishing this afternoon, so I spent some quality time last night and this morning with scissors and a glue stick. I've assembled about a quarter of the set, still have a bunch to do. I love that we've got all the minis we need for an AP adventure available here. Any ETA on Blood for Blood or War of the River Kings? How about if I buy drinks for Crystal at PaizoCon this year? I second the question about future sets for kingmaker! Is the plan to make a set per book? Cause if so... I'm so in. Love the first three! I like the sorta cartooney feel to them, but just serious enough. Does anybody know if these are going to be finished any time soon? Like It's been a full year and no word at all for minis that go along with one of the most popular adventure paths out there. Come on guys, take my money! Ok, so my Kingmaker group has all but disbanded, but my Pokemon/CatchEmAll/OCD still wants to see the sets completed for the Kingmaker AP. Crystal, I'd guess this is not on your front burner, but is it on the stove at all? Any news would be welcome... TY! Almost two years and no news about this fabulous paper mini serie ? Any word on progress of the next books? I bought this set back in 2013 and it looks like we'll finally be starting book 3 in a few weeks! Woohoo!!! Are Pathfinder Paper Minis still a going concern? It looks like no new sets have been released in quite a while. Look for something new from me next week. I didn't even know these existed for Kingmaker! I'll have to pick some up. Any chance the last three parts of the adventure path will see a paper minis set? I enjoy using these and would love to have all the necessary creatures and characters for this path! If Todd is in the flow now, maybe next week? Although it would be great to have the same art style i would be happy with a change if it means we get books 4 to 6. Any news? No new product for this amazing serie ? Any update on future products in this line? Sooo... nothing? They've just released paper minis for jade regent! Where's my Drelev, my Armaag, my irovetti? We're rebooting Kingmaker in our FLGS. I'd love to see the second half of this set! Any chance at all of it getting picked up? Chances are high that Kingmaker could be the next hardcover compilation in 2019. So i imagine there will be a Pawns set then. Just to be clear, there is no announced plan for any more hardcover compilation editions at this time. Paizo has been very clear that planning on such is supposition. Even so, since being a 3.5-era AP and not a Pathfinder version is a big piece of the criteria for which ones get done, Kingmaker has two other APs "ahead" of it that way. 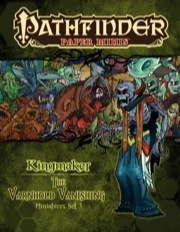 On the plus side, Kingmaker is probably one of the first, if not THE first, Pathfinder APs that would get updated... and that would mean Pathfinder Pawns most likely as a support product. While the official stance is still "no planned hc at this time", it seems it has become "softer" (for lack of a better word) recently. What´s more of a concern is Starfinder taking up much developement power in the ´forseeable future (2017 and 2018) and the sales numbers of the Curse of the Crimson Throne hc are probably still not conclusive enough. From an economical view, compiling sold out single volumes into collections is the norm. My semi-annual plea for paper minis for kingmaker books 4-6. I will solidly back that plea. I'd sure love to see Nyrissa in Frasier's style.